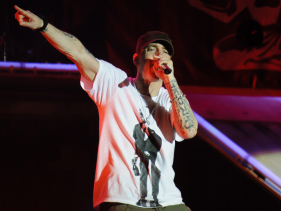 If Eminem was looking to get his old stroke back on his upcoming eight solo album, The Marshall Mathers LP 2, he's right on target with the album's first single, "Berzerk." Joining the likes of Jay Z and Kayne West in tapping old school hip-hop legend Rick Rubin to produce his music, Slim Shady employed the Buddha of Beats to give the song, which dropped Monday night, his signature mix of booming beats and classic rock samples. The song also samples Billy Squier's 1981 hit "The Stroke," which makes total sense given the Rubin connection. The former Def Jam co-founder helped Run-DMC and the Beasties blow their careers up with songs that melded rap and hard rock and "Bezerk" unquestionably has the feel of one of Rubin's 1980s classics. And, after a more somber mood on his post-rehab Relapse and Recovery albums, "Berzerk" brings Em right back to the fun-filled, loose and playful vibe of such early efforts as the original Marshall Mathers LP from 2000. It's the second piece of new music we've heard from Shady this month, coming on the heels of the more aggressive "Survival," which debuted in the trailer for the "Call of Duty: Ghosts" game.